This post is the perfect example of how indecisive I am. Especially when it comes to paint colours. Which of these do I like, you ask? 1. Twilight Zone was one where I actually liked the darker colour (King's Treasure) on the chip, but it looked too dark in the bathroom and I liked the brighter one more! 2. Cabana Coral is fun and definitely leans more to pink, which I think works better with my beige tiles. Not sure if it will cast a weird glow on my face though- anyone have a pink bathroom? 6. Casa Royal actually works pretty well with the tiles and lighting, but I just don't think I am feeling a purple bathroom. 7. Lake Simcoe was really close to the deep teal I was imagining! I also like the Canadian name and my dad has a boat on Lake Simcoe, so that is pretty cool! 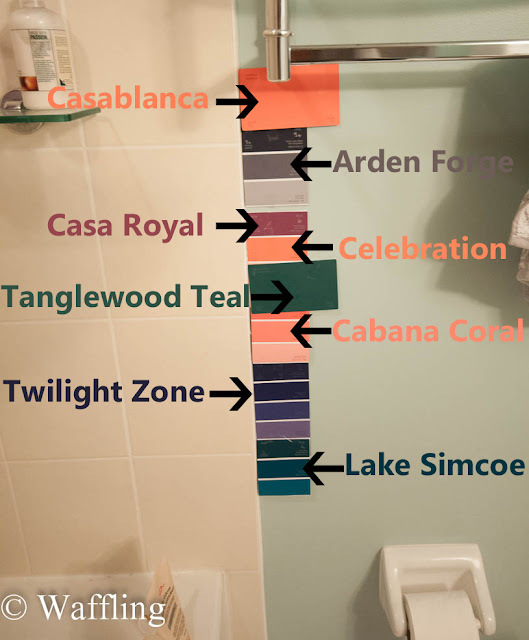 So I think Cabana Coral and Lake Simcoe are the leaders in this race so far, but I do want to head out to a Benjamin Moore or Sherwin Williams to see a larger selection of deep teal and coral options. Then I get the fun of test pots. And then maybe- MAYBE- I will get around to painting the whole bathroom! Lake Simcoe is definitely my fave. Keep in mind with the coral/peachy colours, they're a lot harder to match, imo. I love the Twilight Zone, is there any way that maybe they can lighten it up a bit so it isn't so dark but still the same-ish colour. Not sure I've never asked for such a thing before but I think I've read somewhere that it was done. um...good to know. do not want a peach bathroom! Ok - I did NOT know there were TEST POTS! You have enlightened me! The perfect person to ask is MEGAN. 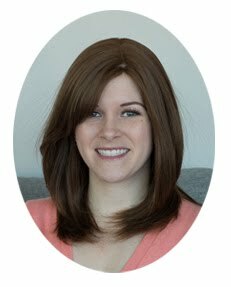 Forward this blog to her. She's even more of an expert now after working at Home Depot. I'm not a good "colour picker" - Meg has all those skills (art). Austin and I just painted Neil's new office a medium grey (not that I'm suggesting that for your bathroom LOL). At first it was too dark, as per Meg's suggestion, I just took it back to Home Depot and they lightened it at no charge, to a lighter shade that Neil liked better. Home Depot rocks. As your bathroom is a room on it's OWN in your condo, I would go with a fairly bold colour, because you CAN. :) Personally, I don't like the peachy colours, I like the Tanglewood Teal or Lake Simcoe. You could check a different paint store, other than Canadian Tire, maybe they'd have more shade selections. Keep looking for teal! It sounds like that is really what you want, and I'm sure there are some other swatches out there you can bring home to test in your light. I love the idea of Tanglewood Teal or Lake Simcoe. Before we demoed our guest bathroom it had peachy-beige tiles (photo), and painting the walls a light blue really helped to make the tile less pink and more tan (well, except for the coral tiles, but even those were less offensive). 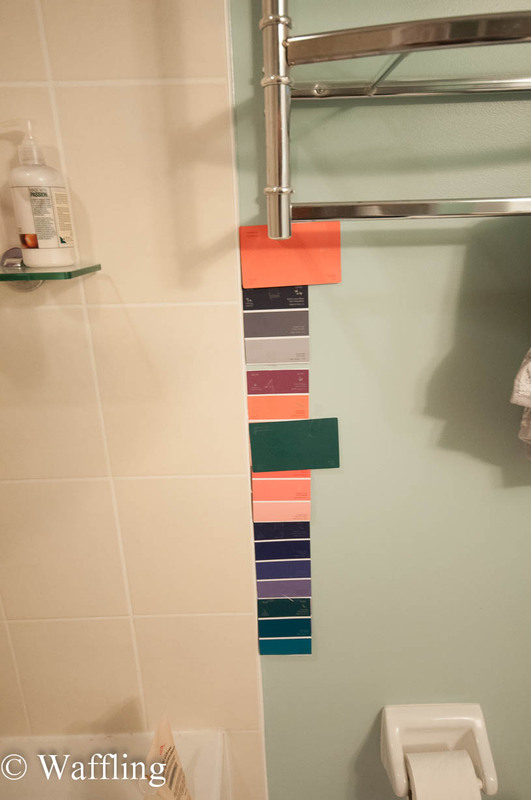 I think the same might be true for your bathroom, a cool color will make the tile look more tan and less fleshy. 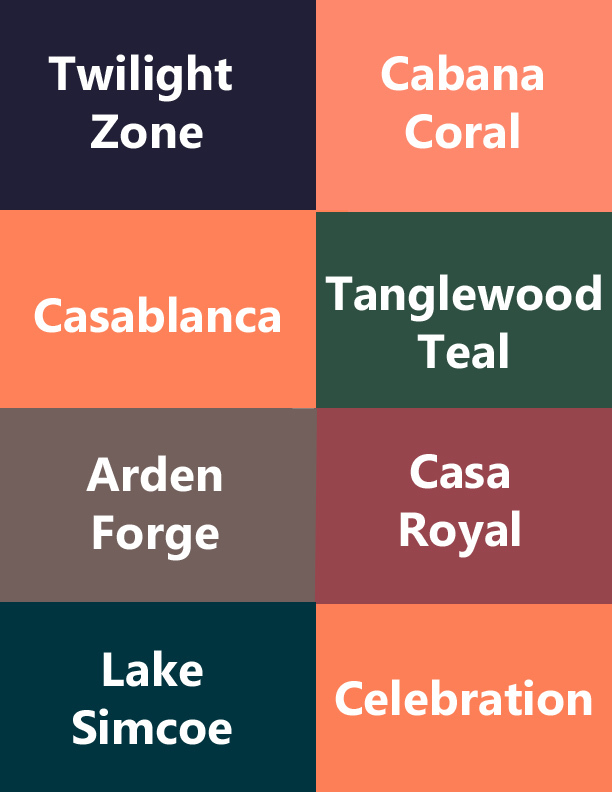 A few Ben Moore teal suggestions (granted this is just based on how they appear online): Newburg Green, Tuscon Teal, Jade Garden, Largo Teal, Galapagos Turquoise, Varsity Blues, and Slate Teal. Jeni and Brandon's Stag & Doe! Would A Casey By Any Other Name Be As Awesome?